Suppose an exporter company makes regular exports 1,000,000 USD per month and wants to hedge its foreign exchange exposure. In this example the comapany is supposed to be a Turkish Company whose domestic currency is Turkish Lira (TRY) and the foreign exchange exposure that the company is faced with is USD/TRY exposure. The exporter company will be long at USD/TRY parity by its exporting activities and should sell USD/TRY in order to hedge its exposure. The spot USD/TRY parity in our example is 1.7885. Forward Contracts: The company can sell USD/TRY on a series of forward contracts. There will be 12 forward contracts on different expiry dates. Average forward rate is 1.8737. This company can choose a structured product composed of some FX options. Here we will cover some of the structured product alternatives that a company can use to hedge its FX exposure. Meaning that the exporter company will sell 500,000 USD if spot rate at the specific expiry date is below 1.9050 and will sell 1,000,000 USD if spot rate at the specific expiry date is above 1.9050. If spot is below 1.9050 then half of the exposure is hedged from the spot level and half of the exposure is hedged from 1.9050 level which is 323 bps above the forward level. If the exporter has a view that the spot rate will increase he can speculate the exposure according to this view while having a protection by using zero cost collar product. If the market moves higher according to the view of the exporter he can get the advantage of the price move upto 2.010 level for USD/TRY. On the other hand if the market moves against his view the exporter has a protection at spot level 1.7885. Exporter puts a cap to its protection and increases its advantage when the spot moves higher. 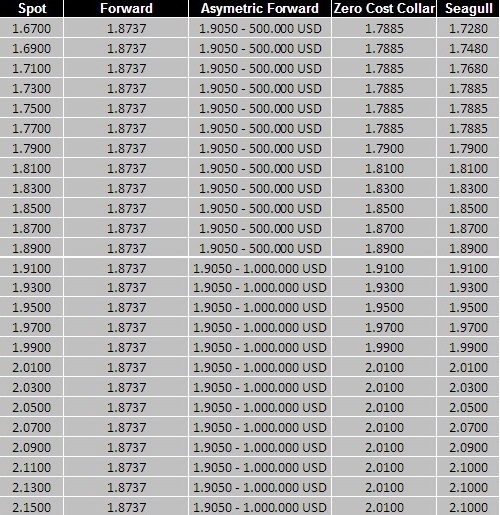 You can see the change of the average hedging cost of the exporter in the below table. As you can see the average costs of the products are identical in the long run. If the exporter does not hedge its exposure he will face with a 1015 ticks standart deviation for average cost of his exposure. If the exporter does not want to face with volatility for the cost of his exposure he should hedge all the exposure with forwards. On the other hand the exporter may wish to decrease the volatility of his average cost but do not want to make it zero. In this case structured products allow the hedger to apply his market view by decreasing the volatility of the outcomes according to unhedged scenario. The use of stripped or accumulating products become useful when the hedger needs to short the currency whose domesitc interest rate is greater than the foreign interest rate. The hedger gets the advantage of the higher long term forward levels. Since the transaction is realized from an average rate the initial transaction of the product will be probably at a very advantageous level according to spot rate. For example in the accumulating asymetric forward case hedger begins to sell the USD/TRY parity from 1.9050 level 1 month later the transaction date.